Nien Gao is a must have for traditional Chinese- it is used mainly for prayers of the Kitchen God. The homemade Nien Gao or Basket Cake’s price has really risen exponentially over the years. 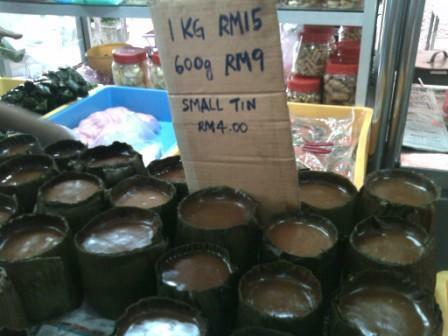 It is made from glutonous rice flour and sugar and lined with banana leaf. Why it is so expensive is because it required steaming for hours- mostly overnight. And to line the tins with the banana leaf is also a huge hassle because if you don’t do it properly, the glutenous rice will leak off the leaf and that cannot be sold. But because of the low cost price, a lot of profit can be made just once a year. Nowadays you can get the commercially made ones from stores and hypermarkets for about few ringgit. People tend to buy that for prayers now- but would not eat it afterwards. This is because the commercialised made ones have so much of preservative that after 2 years, it still looks good. Whereas the homemade nien gao would develop fungus within a week if not eaten (because no preservative). Well, this is just one of the traditional food we have here. Happy Chinese New Year to all and to those who are driving back this, please drive carefully.